Discuss whatever you want here--both QB and non-QB related. Anything from the DEF INT command to the meaning of life! One father found out another interesting aspect of this security feature however when he left his iPad within reach of his kid: there is seemingly no top limit to how long the disable feature will remain in place. 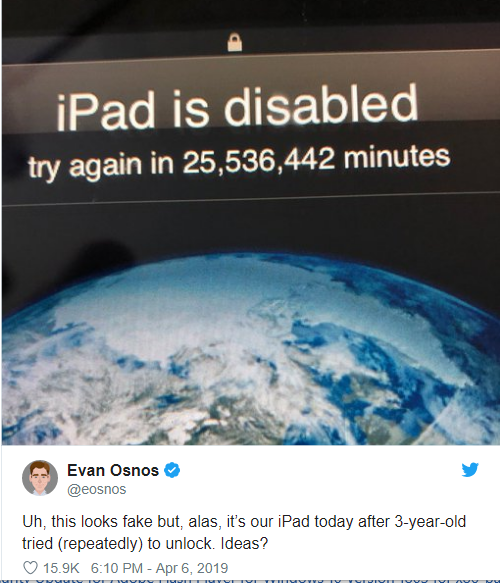 Evan Osnos is a writer at The New Yorker and was very surprised to find on picking up his Apple device that he was going to have to wait a hefty 25,536,442 minutes until he could punch in the right code and gain access. You do have to wonder though: why on earth doesn't Apple have a maximum disable time on its devices? And just how many times did that three-year-old have to get the code wrong to reach 48 years of delay? Please acknowledge and thank members who answer your questions!